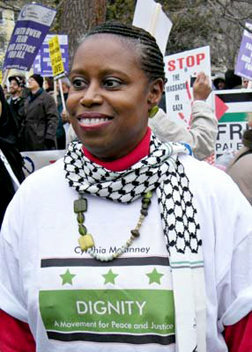 Join Cynthia McKinney in the Bike4Peace cross country tour! Kickoff Critical Mass Meet at the House of Common Sense, 1193 Pine St., Oakland at 7 AM Sat-24-July-2010 for a day long mass bicycle ride to the state capitol in Sacramento. Or join along the way- say, Rodeo, Fairfield, or Davis. We’re converging upon Washington, DC, riding bicycles from across the continent. Join us for a Continental Critical Mass ride. Plan to arrive by Wed-22-Sept-2010. Meet at 10 AM across the pool from Congress. From Cynthia McKinney: Bike4Peace Riders and Hosts needed! We’re scheduled to start on July 24, 2010 at the House of Common Sense in Oakland and we’ll end up at the White House, that needs some common sense!!! Please let me know if you’re interested in joining us. You don’t have to be a pro biker—I’m not!!! But I have a lot of enthusiasm and a desire to change the world and to change myself. I’ll be a better person at the end of this ride because I’ll have time for introspection, time for hearing new points of view from fellow riders, time for hearing from people in towns I’ve never visited before. This will truly be for me, an adventure of a lifetime. And in the process, we’ll spread a message of truth, justice, peace, and dignity. At a time of seeming global chaos, join us and find tranquility (and probably some new leg muscles) out on the open roads of America. Riders will be joining us from Seattle, Vermont, and even from Canada! If you’re willing, we’ll make a way!!! Now, maybe you can’t ride with us, but you want to be involved. If so, please take a long look at the map again and consider hosting us overnight in your home, organization space, or place of worship. I know I’ll need someone who can ease my aching muscles just a little. Just know that every donation will be greatly appreciated. If you’d like to donate your time, money, or services, please let me know or contact Ron Toppi directly at ronbikes4peace@gmail.com; or better yet, just go to http://www.b4p.bbnow.org/donate.php to make a donation. And at the end, maybe the White House will gain a bit of our good, old-fashioned common sense! No more war, bike for peace! I’m not joking. Ted Glick of the Chesapeake Climate Action Network was convicted by a jury May 13th of peacefully dropping the banners inside the U.S. Senate Hart Office Building last September. The DC U.S. Attorney’s office clearly has decided to make an “example” of Ted because of his previous two — count ’em, two — convictions related to peaceful acts of climate civil disobedience. Can you believe it? You can see a three-minute video of Ted’s September “crime” right here. He’s the guy toward the end simply lowering the banners. Period. Now Ted is facing up to three years in jail. Based on the judge’s comments last week, it really does appear that he will be incarcerated for at least a month or two. First, please write a respectful but firm snail-mail letter to Judge Frederick H. Weisberg telling him why you think Ted should not go to jail. The judge’s address is below. Just type something up, print it and mail it off. Explain why only a suspended sentence is fair, especially given all the real injustices out there on global warming. There is reason to believe that that a large number of thoughtful, well-reasoned letters to the judge could bring leniency. Second, take an action right now that will help create a world where global warming is no longer such a threat and people like Ted won’t have to drop banners and get arrested in the first place! Sign the “Windmills, Not Oil Spills” petition to stop new offshore drilling in America and promote clean energy alternatives instead. Thanks for your support, your activism, and your prayers as CCAN fights to keep a morally innocent staff member out of jail during this time of great global crisis. Give your views on what would be a justice-based approach by the legal system toward nonviolent actions of the kind Ted took part in. Please let other people know about this campaign. And it would be helpful if you could send us a copy of your letter to Judge Weisberg, or if you could let us know that you have sent a letter. You can email Ted at ted AT chesapeakeclimate.org, or you could send by regular mail to Ted’s attention at CCAN, P.O. Box 11138, Takoma Park, Md. 20912. Rest in peace Howard Zinn. Your words and actions and examples will live forever. End US Wars, is holding an Emergency Anti-Escalation Rally on December 12 at Lafayette Park at the White House, Washington DC, from 11am to 4pm. Featured speakers include: Cynthia McKinney, Senator Mike Gravel, Chris Hedges, David Swanson, Kathy Kelly, Betty Hall, Granny D (message), Lynne Williams, Elaine Bowers, Mathis Chiroux, Michael Knox, Ron Fisher and others. We are very excited about so many illustrious speakers, with more in the offing. Musical performers include Jordan Page. We expect to do a lot of action in DC around the time of Obama’s announcement. We also are planning events the evening of December 11th–a Green Party event, authors book signings, and Robert Greenwald’s new movie on Afghanistan. On Rally Day, December 12th: congregate at Lafayette Park, White House. Speakers are from 11am to 4 pm, with musical interludes. From 3pm to 4pm there is an organizational meeting ‘tea’ with peace movement leaders, to meet up at the rally, location TBA. Prior to the rally, we are planning a camera ready leaflet, down-loadable from the website www.enduswars.org , to be distributed at the events coming together between now and then, such as at the Dec. 1st peace vigil at 5 pm at the White House, Amy Goodman’s speaking event in DC on Nov. 30, and other spontaneous activities now being discussed in the peace community. It will be available for local rally organizers to download and distribute during the days prior to the December 12th Anti-Escalation Rally. We are sounding the peace cry, declaring that the Peace Movement is not going to stand for the President’s abdication of the people he was elected to serve. We need to send him the message: We have had enough! We ask for your strong support and presence at the rally. Please go to our website: http://www.enduswars.org . The annual community coat exchange events in Utah and Rhode Island saw many people coming to pick up clothes for the winter. A sign of the times? October has several dates with significance for the peace movement. peoples!End war crimes, including torture! We insist on the immediate and unconditional withdrawal of all U.S.
in other parts of the world, such as Haiti. of urgently needed social programs. The Green Party of Texas mourns the tragic loss of Bill Holloway. Bill was a dedicated leader who was currently serving as the Co-Chair of the Travis County Green Party in Austin, TX. 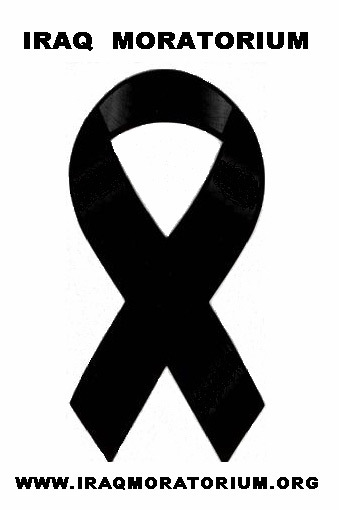 He will be missed as a mentor and a friend. Through his kind-hearted activism, Bill touched the lives of so many people. He was an active Green Party contributor at the local, state and national levels. Bill served on numerous committees in the Green Party and in other organizations as well. Bill Holloway passed away unexpectedly last weekend at his home in Austin, Texas. Given the unexpected nature of his death, we know many will have questions regarding details. Out of respect for Bill, his family, and his lengthy legacy of community service, we hope you understand our reluctance to speculate and request that others will also be circumspect in their communication. family. Bill was a very special person who will be sorely missed. There will be a memorial service in Austin, TX, on Friday, January 16, and his funeral will be in Oklahoma City, OK, on Wednesday, January 14. For the memorial, a book is being compiled for his parents. If you would like to contribute, please write down a story or memory of Bill, with a photo if you have one and send it to Sondra -lonestarsondra AT gmail.com by January 15th. His family never met most of his friends and, we suspect, had no idea of the difference he made in so many lives. The book is being put together to let them know how many people were touched by and loved him. If the photo and the text can be pasted onto one page, that would be ideal, but whatever people can contribute would be appreciated. network of friends in your thoughts, prayers, and/or rituals. Here are some newsworthy items out of Gaza that are unlikely to be making it to the Western presses. The recipient who forward this information received it directly from one of the staff of the Mezan Center for Human Rights. 1. Israel has begun a new policy in Gaza in the past two days called the “roof knock”. This is when a “small” rocket is fired from Israeli military aircraft that is strong enough to blast open the roof of a targeted building. It is sent as a “warning message” to the building’s inhabitants giving them between 2 and 3 minutes to evacuate before the building is completely destroyed. A number of cases of this new technique have been reported recently. 2. While the UN continues to claim that “only” 25% of the casualties from the attacks on Gaza are civilian, the Mezan Center for Human Rights (known for the care it takes not to overstate the numbers and for its strict verification policies) estimates that the number of civilian casualties is approximately 85%. In particular, the number of children has increased to over 200, and the number of women has surpassed 75. One reason for the lower civilian casualty figures used by the UN has to do with the reluctance to consider men other than the elderly and sick as non-combatants. In fact the overwhelming majority of men killed in “Operation Cast Lead” up to now have been non-combatants, including fathers, teachers, shopkeepers, construction workers, laborers, students, as well as the civil policemen. The vast majority are not “Hamas militants.” Note that the civil police are considered ‘non-combatants’ under international law and are therefore not ‘legitimate’ targets in any military confrontation any more than traffic cops or firemen. 3. The UN announced this evening that “almost everyone in the Gaza Strip” is now in need of humanitarian aid. Indeed, even those with adequate food supplies are a) handing out what they have to people in “shelters” (which have been targeted consistently by Israeli war machines in the past); Even those with adequate food supplies are b) unable to obtain bread anywhere. Many are using rice or spaghetti to substitute for carbohydrates—when these are availabe and when there is water and electricity to allow for cooking these items. 4. There are widespread reports now of forced evacuations of entire neighborhoods of people who go mainly to nearby schools or other public buildings not yet destroyed. These are considered no more secure than their homes but remain the only other places to go (other than to move into crowded dwellings with relatives; or places no more secure than their own homes). The congregation of so many people in these enclosed spaces increases the likelihood of major civilian casualties when airstrikes target the area. PLEASE PROTEST THESE AND OTHER ACTIONS OF THE UNITED STATES AND ISRAEL, TWO COUNTRIES THAT CLAIM THE WHOLESALE DESTRUCTION OF A PEOPLE IS A MATTER OF ‘SELF DEFENSE’.